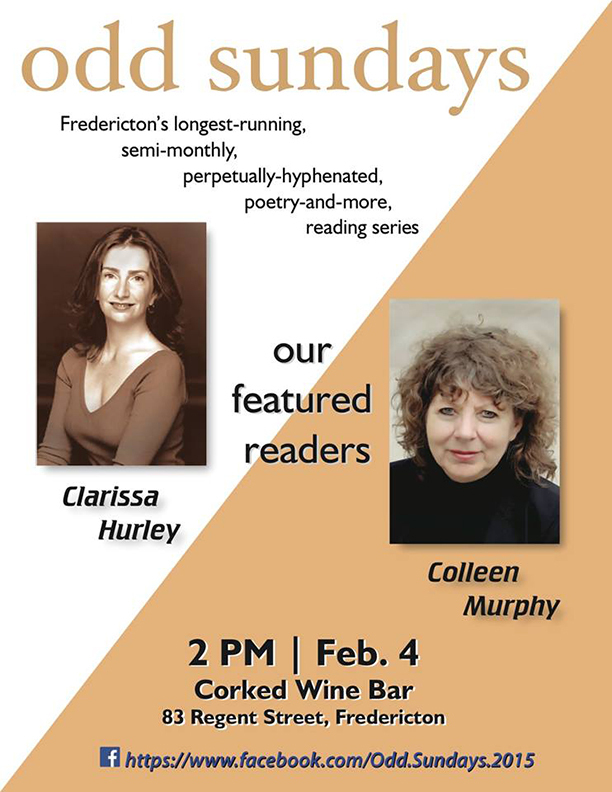 Odd Sundays presents Clarissa Hurley and Colleen Murphy this Sunday, February 4th, at Corked Wine Bar, 83 Regent St. Doors open at 1:30pm and readings start at 2pm, followed by an open mic set and free book draw. Clarissa Hurley is an award-winning actor and playwright, as well as a director and dramaturge. Following her MA in English at UNB, she trained at the Royal Academy of Dramatic Art, the American Academy of Dramatic Arts and U of T’s Centre for Drama, Theatre and Performance Studies. She has been a director of the NotaBle Acts Theatre Company in Fredericton for the past eight years. Formerly a freelance journalist, she has published fiction, and a wide range of articles. Clarissa edits fiction for The Fiddlehead literary magazine. Colleen Murphy is a two-time Governor General Literary Award Winner for Drama. In 2016 she won for her play Pig Girl, and in 2007, for The December Man (L’homme de décembre). In 2017, she had four world premieres in Canada including The Breathing Hole at the Stratford Festival and the opera Oksana G. in Toronto. Colleen is also a filmmaker and her award-winning films have played in festivals around the world. Colleen has been the Writer-in-Residence at Finborough Theatre in London, UK, Necessary Angel Theatre and Factory Theatre in Toronto. She has been Writer in Residence at the University of Regina, McMaster University, University of Guelph, Wilfrid Laurier University, and the Lee Playwright in Residence at the University of Alberta. Colleen is currently Writer-in-Residence at UNB.